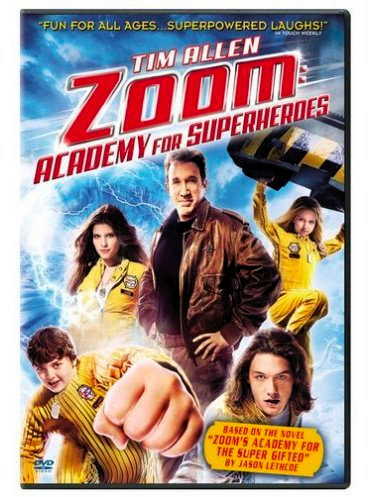 Zoom: Academy for Superheroes is best described as a second-tier Tim Allen movie. In Zoom: Academy for Superheroes Tim Allen plays the role of Jack Shepard, a retired superhero formerly known as Captain Zoom. 30 years previously, Tim Allen/Jack/Zoom led a team of government-sanctioned superheroes known as Zenith Project, until the government decided to increase the superheroes’ powers by exposing them to massive doses of gamma radiation. This went badly, as Zoom’s brother, Conner (superhero name: Concussion) was driven mad by the treatment, and killed the other members of the team and led to Zoom losing his super-speed, and Concussion seemingly being killed as well. Tim Allen/Jack/Zoom has become bitter and cynical due to his experiences. In the present day, the military commander (played by Rip Torn) and his lead scientist Dr. Grant (played by Chevy Chase) know the truth—Zoom’s brother wasn’t killed, but rather exiled to a distant dimension; and he’s working his way back to Earth. In response, they plan on forming a new Zenith Project, with four new misfit super-powered children—and they forcefully recruit Zoom to train them. Assisting Tim Allen/Zoom/Jack is Marsha Holloway (played by Courtney Cox-Arquette), who’s job is to help the children become first a team, and then a family. To complicate the issue, Marsha has an enormous crush on Zoom, and is his biggest fan—as well as being comically clumsy. Tim Allen/Zoom/Jack is at first only going through the motions, but slowly begins to thaw, as he deals with the four children – Dylan, a 17-year-old boy who can turn invisible, Summer, a 16-year-old girl with telekinetic powers and empathy., Tucker, a pudgy 12-year-old boy with the power to enlarge any part of his body, and Cindy, a 6-year-old girl with super strength. For me, one of the highlights of the movie is when Cindy has a nightmare, and comes to Zoom’s room in the middle of the night—“Mr. Zoom, can I sleep in here?”—dressed in a bunny costume. It’s a very sweet moment, the sort of Home Improvement moment that Tim Allen does well. Likewise, he connects with Dylan in the project’s brig, and helps him to realize his secondary ability, to see mentally other places. Using this, he discovers that Zoom’s brother is returning—and that the government is planning on subjecting the kids to the same Gamma-13 treatment that ruined Zoom’s life. This leads up to the conclusion, where Zoom and Marsha help the kids to escape and confront Zoom’s brother. Will they escape the Gamma-13? Will the new kids be able to stop Concussion, who destroyed the original Zenith Project? Will Zoom regain his super-speed ability? Why are we even asking this questions? It’s a Disney film, after all. It’s a cute film, and I personally prefer it to Sky High—but not by much, and I’m frankly not a fan of that movie. Pros include Tim Allen playing the title role of Zoom, managing to entice the audience into liking the cynical former hero, and the four actors playing the new heroes – Cindy, especially. What was truly a negative was Chevy Chase, striving to regain his comedic timing, and for the most part failing. There’s an extended scene where the children find him in an “environmental simulation room” where they give him a little payback for the grief that he’s caused them during the training, and it’s legitimately funny—but it’s also legitimately unnecessary; had it been edited out of the movie, it wouldn’t have made any difference to the telling of the story.